Boo! It's time to create a festive preschool bulletin board. Preschoolers will have fun with a favorite Halloween story and use their creative talents to create a cute pumpkin patch bulletin board. All just in time for cupcakes and punch at their Halloween party. 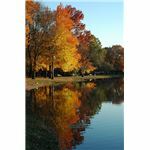 Fall is an exciting time of the year. Leaves change colors and fall off the trees. Pumpkins and apples are ready to be harvested. Preschoolers gear up for traditional Halloween festivities. Engage your students with a fun story, make a pumpkin craft, and a class scarecrow for a cute Halloween bulletin board scene. Gather your preschool class for storytime. First ask your class what it means to be afraid of something. Listen to several ideas from the class. Introduce the book, The Little Old Lady Who Was Not Afraid of Anything written by Linda Williams. Read the book through the first time for enjoyment. The children will learn that the Little Old Lady was walking home through the woods. She starts out walking slowly, but walks a little faster each time she meets up with various articles of clothing and finally a pumpkin head. Once safely inside her house, the items knock on her door. The Little Old Lady whispers something into the ear of the pumpkin head who nods its head as she closes the door. The Little Old Lady goes to bed and the next morning she finds a surprise in her garden! After reading the book, ask the children to recall the items that were following the Little Old Lady home. Have the children brainstorm ideas for actions or motions they could perform when the story is read again. For example, the boots in the story go stomp, stomp. The children may suggest that they stand and stomp their feet to mimic that part of the story. The gloves in the story go clap, clap. Therefore, the children may suggest that they clap their hands when this part of the story is read aloud. Re-read the story through. Have the children perform the actions they come up with for each item that follows the Little Old Lady. 1. Give each student a paper plate. Have the children use the paintbrush to paint the paper plate orange. Allow this part of the craft to dry before going on to the next step. 2. Give each child a green piece of construction paper and a pair of scissors. Ask the children to cut out a stem for the top of their pumpkin. The children may use glue to attach the stem on to their pumpkin. 3. Provide the children with glue and a handful of pumpkin seeds. Have the children glue the pumpkin seeds onto their orange pumpkin. Have the children ball up old newspaper or newsprint paper, which will be used to stuff a scarecrow for the bulletin board display. Have child size jeans and a plaid flannel shirt nearby to be stuffed with the newsprint the children have crumpled. Place rubber bands around the wrist areas of the shirt and the ankle area of the jeans to close off the open ends. This will keep the paper stuffing inside the scarecrow. 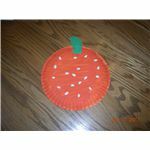 You will need to add a pumpkin face that can easily be made with orange and black construction paper. Now it is time to determine a background color for the bulletin board and a complimenting border you would like to use. Once each of these are on the bulletin board you will need to determine the best way to hang up the scarecrow. One suggestion would be a peel and stick plastic hanging hook. After the scarecrow is in place, you will need to randomly staple the children's paper plate pumpkin craft all over the bulletin board. Once the pumpkins are in place, you will want to add a green vine such as a piece of green yarn that starts at one pumpkin stem and goes from stem to stem until all of the paper plate pumpkin crafts are attached to the green pumpkin vine. Add a little embellishment by sporadically adding green pumpkin leaves to the vine where you may have a little room. To complete the pumpkin patch bulletin board display, you will need to create a title banner. 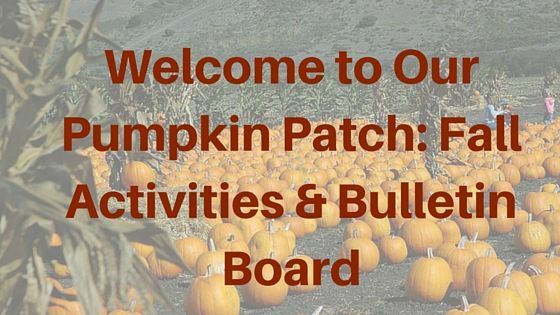 "Happy Halloween From Our Pumpkin Patch To Yours"
"Welcome To Our Pumpkin Patch"
Preschoolers will love this not so spooky Halloween tale as well as the activities that go with it. They will be so proud to show off their pumpkin craft displayed on the bulletin board to any family members or friends that visit the classroom. Williams, Linda. The Little Old Lady Who Was Not Afraid of Anything, Harper Collins, 1988.